Singing is on of the basic human art forms; apart from humming, whistling or tapping some part of the body, it is the only way of making music. We share the art with various other creatures on this planet and, as far as we can tell, humans have always sung in one form or another and in every culture. 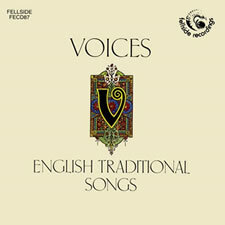 The collection of songs on this recording belongs to a group called English Traditional folk songs and they are presented in their simplest form - unaccompanied by musical instruments. To describe some of the singing here as simple is to do the singers a grave injustice because you will find here some of the supreme stylists performing within the genre; from the gentle nuances of Dave Burland's style, through the intricate decorations of Maddy Prior and Martyn Wyndham-Read, all way to the outrageous mannerisms of Pete Bellamy. The harmony singing takes in the highly structured part singing of Swan Arcade as well as the loose harmonies of The Watersons.